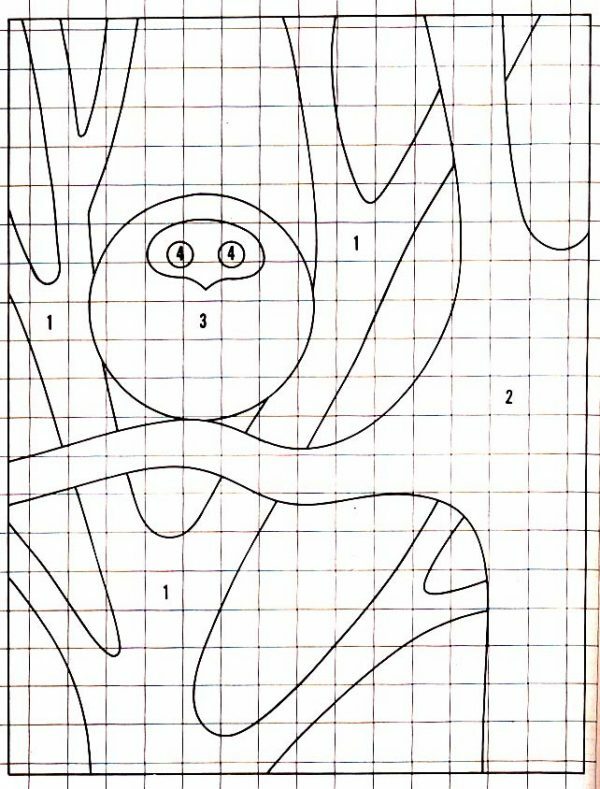 This cute little round owl sitting in his tree was published in the McCall’s Fall and Winter 1973-1974 Needlework Magazine. Every time I see an owl I think of my mother-in-law who collected them. 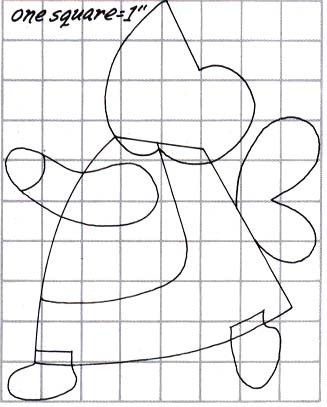 This whimsical fellow would look great on a pillow or tote or as a center panel on a quilt top. He could be done in a monochromatic colour scheme as well as standing out in bright colours on his own tree branch for a child’s room. 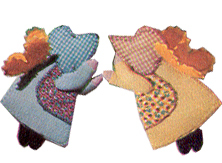 Sunbonnet Sue, one of my favourite quilting figures. Who can resist her, especially as a little angel? These little angels from the Better Homes and Gardens Christmas Issue 1976 were done in colours used in that decade. She was stuffed and had two dimensional wings so she could hang on a tree or as a swag over a mantle. I prefer her done in real red and green Christmas colours. She would look great adorning a Christmas tree skirt or as a Christmas quilt for your favourite rocking chair. Kaffe Fassett is renowned for colour and design. 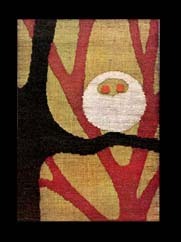 Knitters, needlework artists and quilters among others all know and love his work. He has designed his own fabrics since 1996. I was first introduced to Kaffe’s designs through a knitting show on PBS and now am the proud owner of several of his books. Quilt Romance, published in 2009 has the greatest, brightest quilts imaginable, all set out on gates, bridges and buildings in the Portmeirion Village in Whales www.portmeirion-village.com Portmeirion alone is a good reason to buy this book, add the quilts and you have a masterpiece. The photos literally sing to you as you turn page after page after page, 20 quilts in all. 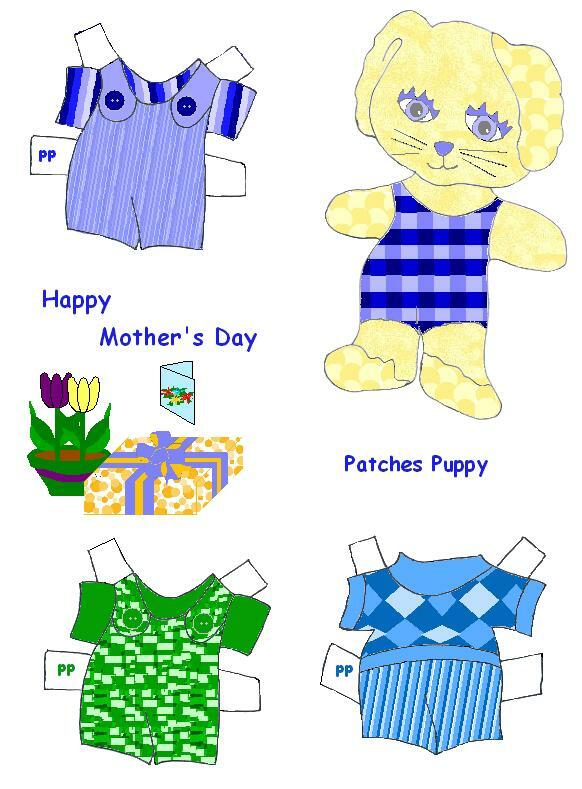 Clear instructions with full size templates and a catalogue of the fabrics used in the quilts are all included. Happy quilting everyone. 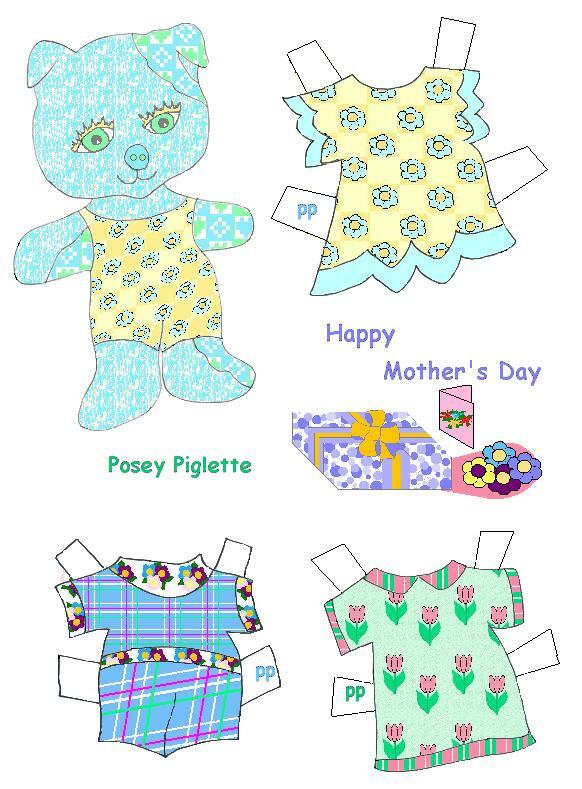 Posey Piglette and Patches Puppy are back for May. They are very excited this month. Their mothers will be opening their Mother’s Day presents that Posey and Patches bought all by themselves for the first time. I wonder what they will be making their mothers for breakast? Do you have any ideas?